NaBH4, CH3CO2H, Pd/C has been described as an effective reagent system to hydrogenate alkenes. Here, we show that the hydrogenation occurs chemoselectively, making it possible to hydrogenate alkenes under Pd/C catalysis with hydrogen created in situ without O- or N-debenzylation. One of the most common procedures for the hydrogenation of alkenes in a chemistry laboratory is the hy­drogenation over palladium catalysts such as over palladium on carbon (Pd/C). Because of the danger of working with H2 in our laboratory, we looked for a reaction system that would generate H2 in situ. Recently, A. T. Russo et al. have published reaction conditions (NaBH4, CH3CO2H, Pd/C) that would achieve this. We could utilize this system, e.g., in the hydrogenation of 1 to 2 (Scheme 1), where 2 is a precursor to quinines 3 linked to a carrier. At the time, we exchanged the published solvent of the reaction, toluene, to the more easily removable benzene. Scheme 1. Olefin hydrogenation with NaBH4, CH3CO2H, Pd/C. hydrogenated, of course. If the actual desired transformation, however, is to be the hydrogenation of a double bond in the substrate, then one risks losing the benzyl functions as protective groups in the molecule at the same time. Oftentimes, the hydrogenation reaction is not chemoselective, but coincides with the reduction of nitro groups, azide functions, dehalogenations and also with O- and N-debenzylations of O-benzyl ethers and esters, N-benzyl amines and amides. In recent times, more chemoselective catalysts have been developed, mainly based on platinum group metals. These catalysts include polymer-imprinted platinum  , ZnX2-Pd/C and Pt/C systems  and platinum sulfides  , and specifically prepared Pd-catalysts  . Also, the addition of amines   or diphenyl sulfide  to Pd/C or Pt/C has been found to make the catalysts more chemoselective, where the hydrogenation of alkenes is not accompanied by all of the side reactions mentioned above. With all of the above catalysts available, it is still of importance to develop new chemoselective hydrogenation systems, where the catalysts can be simply prepared. In the following, the authors show that the reaction system NaBH4, CH3CO2H, Pd/C can be used for the hy­drogenation of alkenes without the loss of O-benzyl or N-benzyl groups, so that benzyl ethers, benzyl esters and N-benzyl amides are not converted concurrently to alcohols, acids, and amides, respectively. Melting points were measured on a Stuart SMP 10 melting point apparatus and are uncorrected. Infrared spectra were measured with a Thermo/Nicolet Nexus 470 FT-IR ESP Spectrometer. 1H and 13C NMR spectra were recorded with a Varian 400 NMR (1H at 395.7 MHz, 13C at 100.5 MHz) and a Varian 200 MHz NMR spectrometer (1H at 200.0 MHz, 13C at 50.3 MHz). The chemical shifts are relative to TMS (solvent CDCl3, unless otherwise noted). Mass spectra were measured with a JMS-01-SG-2 spectrometer. CHN-analysis was performed on a LECO TruSpec Micro instrument. Column chromatography was carried out on silica gel (60 A, 230 - 400 mesh, Sigma-Aldrich). 5w% Palladium on carbon (Aldrich, 205680) was used in all experiments. NaBH4 and acetic acid were ac­quired commercially. Benzene, toluene and THF were used without prior purification. Benzyl esters 12, 16, 18, 36, and 40 were prepared from the corresponding acids (benzyl alcohol, PPh3, BrCCl3, CH2Cl2) following a known procedure  . Methyl ester 14 was prepared by Wittig olefination from 3-benzyloxy-4-methoxyben- zaldehyde and methoxycarbonylmethylidenetriphenylphosphorane in a minimal amount of CHCl3. Also, N-benzyl amides 27, 29, 31 and 33 were synthesized from the corresponding acids (benzylamine, PPh3, BrCCl3, CH2Cl2)  . Substituted dibenzyl ethers 38 and 43 were obtained by Wilkinson-type etherification (ArCH2OH, benzyl chloride, KOH, DMSO) as was 2-benzyloxycinnamaldehyde (24) (2-hydroxycinnamaldehyde, benzyl chloride, KOH, DMSO). 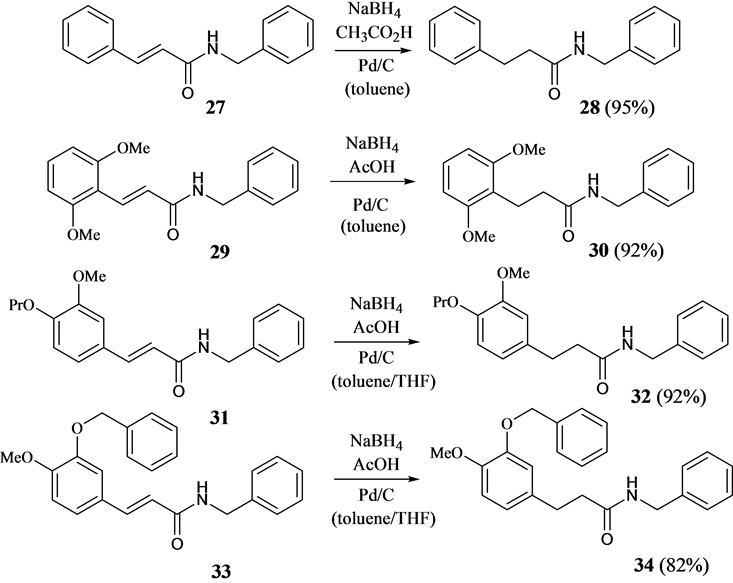 20 and 22 were prepared by Wittig olefination, starting from 2-benzyloxybenzaldehyde and benzoylmethylidenetriphenylphosphorane and from 2-benzyloxycinnamaldehyde (24) and toluoylmethylidenetriphenylphosphorane. Caution: In the presence of dry palladium on carbon, hydrogen enflames upon contact with air. Therefore, it is advisable to purge the reaction flasks with an inert gas before use in the described hydrogenation. Also, where filtrating the reaction mixture directly, especially when using a paper filter, it must be noted that the filter cake upon drying can enflame due to the fact that unreacted sodium borohydride slowly hydrolyses with air moisture, thereby releasing hydrogen. Therefore, after diligent washing with chloroform, the filter and filter cake should be immersed in water. To a solution of methyl o-benzyloxycinnamate (6, 188 mg, 0.70 mmol) in benzene (10 mL) is given Pd/C (70 mg, 5 wt%) and acetic acid (AcOH, 100 mg). Thereafter, is added portionwise NaBH4 (128 mg, 3.38 mmol). After 3 h at rt, further AcOH (50 mg) and NaBH4 (60 mg, 1.58 mmol) are added successively, and the resulting mixture is stirred at rt for 12 h. Thereafter, half conc. aq. HCl is added dropwise until there is no futher gas evolution. H2O (30 mL) is added and the mixture is extracted with CH2Cl2 (3 × 20 mL). The combined organic phase is dried over anhydrous MgSO4, concentrated in vacuo and the residue is subjected to column chromatography on silica gel (CH2Cl2) to give 13 (175 mg, 93%) as a colorless oil; νmax (neat/cm−1) 3064, 3033, 2950, 1736, 1601, 1588, 1493, 1453, 1436, 1381, 1290, 1241, 1193, 1162, 1025, 752; δH (400 MHz, CDCl3) 2.65 (2H, t, 3J = 7.6 Hz), 3.01 (2H, t, 3J = 7.6 Hz), 3.64 (3H, s, OCH3), 5.09 (2H, s, OCH2), 6.87 - 6.92 (2H, m), 7.16 - 7.46 (8H, m); δC (100.5 MHz, CDCl3) 26.2 (CH2), 34.0 (CH2), 51.5 (OCH3), 69.7 (OCH2), 111.5 (CH), 120.7 (CH), 127.0 (2C, CH), 127.6 (CH), 127.8 (CH), 128.6 (2C, CH), 129.1 (Cquat), 130.1 (CH), 137.2 (Cquat), 156.5 (Cquat), 173.8 (Cquat, CO); MS (EI, 70 eV) m/z (%) 270 (M+, 85). To a mixture of N-benzyl cinnamide (335 mg, 1.41 mmol) and Pd/C (70 mg, 5 w%) in toluene (8 mL) was added acetic acid (210 mg) and subsequently NaBH4 (185 mg). After the mixture was stirred for 14 h, it was filtered, and the filter cake was washed with CHCl3 (3 × 15 mL). The combined organic phase was concentrated in vacuo, and the residue was subjected to column chromatography on silica gel (ether/CHCl3/hexane 2:2:1) to give 28 (315 mg, 95%) as a colorless solid, mp. 90˚C - 93˚C; νmax (KBr/cm−1) 3292 (s, NH), 3061, 3026, 2924, 1639, 1543, 1495, 1453, 1227, 1029, 741, 694; δH (400 MHz, CDCl3) 2.51 (2H, t, 3J = 7.6 Hz), 2.99 (2H, t, 3J = 7.6 Hz), 4.38 (2H, d, 3J = 5.6 Hz), 5.66 (1H, bs, NH), 7.12 - 7.29 (10H, m); δC (100.5 MHz, CDCl3) 31.7 (CH2), 38.5 (CH2), 43.6 (CH2), 126.3 (CH), 127.5 (CH), 127.7 (2C, CH), 128.4 (2C, CH), 128.6 (2C, CH), 128.7 (2C, CH), 138.1 (Cquat), 140.7 (Cquat), 171.9 (Cquat, CO). To a mixture of benzyl 2-nitrobenzoate (40, 361 mg, 1.4 mmol), Pd/C (100 mg, 5w%) and AcOH (210 mg) in benzene (10 mL) is slowly added NaBH4 (185 mg, 4.87 mmol), and the resulting reaction mixture is stirred at rt for 14 h. Thereafter, the mixture is filtrated and the filter cake is washed with CHCl3 (2 × 20 mL). Column chromatography on silica gel (ether/CH2Cl2 1:10 → ethyl acetate/hexane 1:1) gave 41 (225 mg, 71%) as a pale solid; mp. 75˚C (Lit. 76˚C - 77˚C  ); νmax (KBr/cm−1) 3033, 2950, 1693, 1615, 1487, 1455, 1378, 1291, 1243, 1161; δH (400 MHz, CDCl3) 5.34 (2H, s OCH2), 6.62 - 6.68 (2H, m), 7.24 - 7.41 (4H, m), 7.44 (2H, d, 3J = 8.8 Hz), 7.93 (1H, d, 3J = 8.0 Hz); δH (400 MHz, CDCl3) 66.0 (OCH2), 110.7 (Cquat), 116.4 (CH), 116.7 (CH), 128.0 (2C, CH), 128.1 (CH), 128.6 (2C, CH), 131.3 (CH), 134.2 (CH), 136.3 (Cquat), 150.5 (Cquat), 167.9 (Cquat, CO) and 42 (38 mg, 20%). To a mixture of benzyl 2-nitrobenzoate (40, 361 mg, 1.4 mmol), Pd/C (100 mg, 5 w%) and AcOH (210 mg) in benzene (10 mL) is slowly added NaBH4 (185 mg, 4.87 mmol), and the resulting reaction mixture is stirred at rt for 14 h. Then, additional AcOH (105 mg) and NaBH4 (100 mg, 2.63 mmol) were added, and the reaction was stirred at rt for an additional 10h. Thereafter, half-conc. aqHCl is added dropwise. Subsequently, water (25 mL) is added, and the mixture is extracted with ethyl acetate (3 × 20 mL). The combined organic phase was dried over anhydrous MgSO4 and concentrated in vacuo. The residue was subjected to column chromatography on silica gel (ethyl acetate-hexane 1:1) to give anthranilic acid (42, 163 mg, 85%) as a beige-colored solid, mp. 144˚C - 146˚C (Lit. 146˚C - 147˚C  ); νmax (KBr/cm−1) 3472 (NH), 3373 (NH), 3040 - 2350 (bs, OH), 1672, 1617, 1588, 1563, 1485, 1419, 1301, 1247, 1161, 916, 753, 659; δH (400 MHz, CDCl3) 6.65 - 6.69 (2H, m), 7.29 - 7.33 (1H, m), 7.92 (1H, dd, 3J = 8.4 Hz, 4J = 1.6 Hz); δH (400 MHz, CDCl3) 109.5 (Cquat), 116.5 (CH), 116.8 (CH), 132.1 (CH), 135.1 (CH), 151.1 (Cquat), 173.1 (Cquat, CO); MS (EI, 70 eV) m/z (%) 137 (M+, 64), 119 (100), 92 (81, M+-CHO2). Ethyl 3-benzyloxy-4-methoxypropionate (15)  . -as a colorless oil; νmax (neat/cm−1) 1731 (CO), 1515; δH (400 MHz, CDCl3) 1.22 (3H, t, 3J = 7.2 Hz, CH3), 2.53 (2H, t, 3J = 7.2 Hz), 2.83 (2H, t, 3J = 7.2 Hz), 3.85 (3H, s, OCH3), 4.09 (2H, q, 3J = 7.2 Hz), 5.11 (OCH2), 6.73(5) (1H, dd, 3J = 8.4 Hz, 4J = 2.0 Hz), 6.74 (1H, d, 4J = 2.0 Hz), 6.81 (1H, d, 3J = 8.4 Hz), 7.27 - 7.44 (5H, m); δC (100.5 MHz, CDCl3) 14.2 (CH3), 30.5 (CH2), 36.1 (CH2), 56.1 (OCH3), 60.4 (OCH2), 71.0 (OCH2), 111.8 (CH), 114.4 (CH), 120.8 (CH), 127.3 (2C, CH), 127.8 (CH), 128.5 (2C, CH), 133.1 (Cquat), 137.1 (Cquat), 148.0 (Cquat), 148.1 (Cquat), 173.0 (Cquat, CO); MS (EI, 70 eV) m/z (%) 300 (M+, 31). Benzyl 3-[2-benzyloxyphenyl]propionate (17)  .-colorless oil; νmax (neat/cm−1) 3064, 3033, 2933, 1735, 1601, 1588, 1491, 1450, 1382, 1232, 1110, 1009, 910, 853, 742, 696; δH (400 MHz, CDCl3) 2.71 (2H, t, 3J = 7.6 Hz), 3.05 (2H, t, 3J = 7.6 Hz), 5.09 (4H, s), 6.87 - 6.89 (2H, m), 7.15 - 7.42 (12H, m); δC (100.5 MHz, CDCl3) 26.3 (CH2), 34.2 (CH2), 66.1 (OCH2), 69.7 (OCH2), 111.6 (CH), 120.8 (CH), 127.0 (2C, CH), 127.6 (CH), 127.7(5) (CH), 128.1 (2C, CH), 128.5 (3C, CH), 128.5(5) (2C, CH), 129.1 (Cquat), 130.1 (CH), 136.1 (Cquat), 137.2 (Cquat), 156.6 (Cquat), 173.2 (Cquat, CO); MS (EI, 70 eV) m/z (%) 346 (M+, 73). Benzyl 3-[4-ethoxyphenyl]propionate (19). -colorless oil; νmax (KBr/cm−1) 3065, 3033, 2979, 2930 1736, 1612, 1512, 1454, 1383, 1297, 1242, 1150, 1116, 1048, 923, 825, 737, 698; δH (400 MHz, CDCl3) 1.40 (3H, t, 3J = 7.2 Hz), 2.64 (2H, t, 3J = 7.6 Hz), 2.90 (2H, t, 3J = 7.6 Hz), 3.99 (2H, q, 3J = 7.2 Hz, OCH2), 5.10 (2H, s, OCH2), 7.29 (2H, d, 3J = 7.6 Hz), 7.34 (2H, d, 3J = 7.6 Hz), 6.79 (2H, d, 3J = 8.8 Hz), 7.08 (2H, d, 3J = 8.8 Hz); δC (100.5 MHz, CDCl3) 14.9 (CH3), 30.1 (CH2), 36.2 (CH2), 63.4 (OCH2), 66.2 (OCH2), 114.4 (2C, CH), 128.2 (2C, CH), 128.5 (2C, CH), 129.2 (2C, CH), 132.3 (CH), 135.9 (Cquat), 138.9 (Cquat), 157.5 (Cquat), 172.8 (Cquat, CO); MS (EI, 70 eV) m/z (%) 284 (M+, 43). 2-(2’-Benzyloxyphenyl)ethyl phenylketone (21)  . -colorless oil; νmax (KBr/cm−1) 3063, 2929, 1682, 1598, 1495, 1450, 1240, 1111, 1021, 740; δH (400 MHz, CDCl3) 3.09 (2H, t, 3J = 7.2 Hz), 3.27 (2H, dt, 3J = 7.2 Hz, 4J = 1.2 Hz), 5.11 (2H, s, OCH2), 6.89 - 6.95 (2H, m), 7.17 - 7.25 (2H, m), 7.30 - 7.53 (8H, m), 7.90 (2H, d, 3J = 7.6 Hz); δC (100.5 MHz, CDCl3) 26.1 (CH2), 39.1 (CH2), 69.9 (OCH2), 111.6 (CH), 120.9 (CH), 127.3 (2C, CH), 127.5 (CH), 127.9 (CH), 128.1 (2C, CH), 128.5 (2C, CH), 128.6 (2C, CH), 129.8 (Cquat), 130.4 (CH), 132.8 (CH), 136.8 (Cquat), 137.2 (Cquat), 156.6 (Cquat), 200.1 (Cquat, CO); MS (EI, 70 eV) m/z (%) 316 (M+, 23). 1-Benzyloxy-2-[4-(4-methylbenzoyl)butyl]benzene (23). -colorless oil; νmax (KBr/cm−1) 3062, 3032, 2927, 2858, 1680, 1606, 1493, 1451, 1379, 1290, 1238, 1180, 1112, 1025, 752, 696; δH (400 MHz, CDCl3) 1.61 - 1.82 (4H, m), 2.40 (3H, s, CH3), 2.72 (2H, t, 3J = 7.2 Hz), 2.93 (2H, t, 3J = 7.2 Hz), 5.07 (2H, s, OCH2), 6.88 - 6.91 (2H, m), 7.13 - 7.44 (9H, m), 7.83 (2H, d, 3J = 8.0 Hz); δC (100.5 MHz, CDCl3) 21.6 (CH3), 24.3 (CH2), 29.6 (CH2), 30.1 (CH2), 38.3 (CH2), 69.8 (OCH2), 111.6 (CH), 120.7 (CH), 126.9 (CH), 127.1 (2C, CH), 127.7 (CH), 128.2 (2C, CH), 128.5 (2C, CH), 129.2 (2C, CH), 130.0 (CH), 131.1 (Cquat), 134.6 (Cquat), 137.5 (Cquat), 143.5 (Cquat), 156.5 (Cquat), 200.2 (Cquat, CO); MS (EI, 70 eV) m/z (%) 328 (M+, 17). 3-(2-Benzyloxyphenyl)propionaldehyde (25)  . -colorless oil; νmax (KBr/cm−1) 2929, 1722, 1600, 1493, 1452, 1382, 1238, 1118, 1019, 748; δH (400 MHz, CDCl3) 2.75 (2H, dt, 3J = 7.6 Hz, 4J = 1.6 Hz), 3.00 (2H, t, 3J = 7.6 Hz), 5.08 (2H, s), 6.87 - 6.92 (2H, m), 7.13 - 7.20 (2H, m), 7.30 - 7.43 (5H, m), 9.78 (1H, t, 3J = 1.6 Hz); δC (100.5 MHz, CDCl3) 23.5 (CH2), 43.9 (CH2), 69.8 (OCH2), 111.6 (CH), 120.8 (CH), 127.1 (2C, CH), 127.7 (CH), 127.9 (CH), 128.6 (2C, CH), 128.9 (Cquat), 130.1 (CH), 137.1 (Cquat), 156.5 (Cquat), 202.4 (CHO); MS (EI, 70 eV) m/z (%) 240 (M+, 13). 3-(2-Benzyloxyphenyl)propan-1-ol (26)  . -colorless oil; νmax (KBr/cm−1) 3351 (broad, OH), 3064, 3033, 2933, 2864, 1600, 1587, 1493, 1452, 1381, 1239, 1041, 910, 751, 696; δN (400 MHz, CDCl3) 1.86 (2H, tt, 3J = 7.2 Hz, 3J = 6.0 Hz, CH2), 2.78 (2H, t, 3J = 7.2 Hz, CH2), 3.60 (2H, t, 3J = 6.0 Hz, OCH2), 5.08 (2H, s, OCH2), 6.90 - 6.94 (2H, m), 7.15 - 7.20 (2H, m), 7.31 - 7.45 (5H, m); δC (100.5 MHz, CDCl3) 26.0 (CH2), 33.0 (CH2), 61.9 (OCH2), 70.1 (OCH2), 111.7 (CH), 121.0 (CH), 127.2 (CH), 127.3 (2C, CH), 128.0 (CH), 128.6 (2C, CH), 130.3 (CH), 130.4 (Cquat), 137.0 (Cquat), 156.6 (Cquat); MS (EI, 70 eV) m/z (%) 240 (M+, 25). N-Benzyl 3-(2,5-dimethoxyphenyl)propionamide (30). -as a colorless solid, mp. 154˚C - 155˚C; νmax (KBr/ cm−1) 3311, 3063, 2948, 2839, 1638, 1593, 1541, 1474, 1255, 1161, 1113, 774; δH (400 MHz, CDCl3) 2.61 (2H, t, 3J = 7.2 Hz), 2.95 (2H, t, 3J = 7.2 Hz), 3.67 (2C, 2 OCH3), 6.42 (1H, s, NH), 6.48 (2H, d, 3J = 8.4 Hz), 7.13 (1H, dd, 3J = 8.4 Hz, 3J = 8.4 Hz), 7.15 - 7.20 (2H, m), 7.26 - 7.33 (3H, m); δC (100.5 MHz, CDCl3) 18.6 (CH2), 35.5 (CH2), 43.7 (CH2), 55.4 (2C, 2 OCH3), 103.6 (2C, CH), 116.5 (Cquat), 127.4 (2C, CH), 128.0 (2C, CH), 128.6 (2C, CH), 138.2 (Cquat), 157.9 (2C, Cquat), 173.1 (Cquat, CO); MS (FAB, 3-nitrobenyl alcohol) m/z (%) 300 (MH+, 15). N-Benzyl 3-(3-methoxy-4-propoxyphenyl)propionamide (32). -as a colorless solid; mp. 127˚C; νmax (KBr/ cm−1) 3292 (NH), 3057, 3028, 2962, 2934, 2874, 1640, 1550, 1515, 1453, 1256, 1227, 1136, 1025, 803, 741, 697; δH (400 MHz, CDCl3) 1.02 (3H, t, 3J = 7.6 Hz, CH3), 1.85 (2H, qt, CH2, 3J = 7.6 Hz, 3J = 6.8 Hz), 2.49 (2H, t, 3J = 7.6 Hz, CH2), 2.92 (2H, t, 3J = 7.6 Hz, CH2), 3.80 (3H, s, OCH3), 3.92 (2H, t, 3J = 6.8 Hz, OCH2), 4.38 (2H, d, 3J = 1.2 Hz, CH2), 5.69 (1H, bs, NH), 6.69 (1H, dd, 3J = 8.0 Hz, 4J = 2.0 Hz), 6.71 (1H, d, 4J = 2.0 Hz), 6.76 (1H, d, 3J = 8.0 Hz), 7.24 - 7.31 (5H, m); δC (100.5 MHz, CDCl3) 10.5 (CH3), 22.5 (CH2), 31.4 (CH2), 38.8 (CH2), 43.6 (NCH2), 55.9 (OCH3), 70.5 (OCH2), 112.1 (CH), 113.0 (CH), 120.2 (CH), 127.5 (CH), 127.7 (2C, CH), 128.7 (2C, CH), 133.3 (Cquat), 138.1 (Cquat), 147.0 (Cquat), 149.3 (Cquat), 172.0 (Cquat, CO); MS (FAB, 3-nitrobenzyl alcohol) m/z (%) 328 (MH+, 23). N-Benzyl 3-benzyloxy-4-methoxyphenylpropionamide (34). -colorless solid, mp. 142˚C - 143˚C; νmax (KBr/ cm−1) 3301 (bs, NH), 2936, 1644 (C = O), 1514, 1252, 1154, 1133, 1110, 1049, 1016, 698; δH (400 MHz, CDCl3) 2.39 (2H, t, 3J = 7.6 Hz), 2.86 (2H, t, 3J = 7.6 Hz), 3.85 (3H, s, OCH3), 4.31 (2H, d, 3J = 5.6 Hz), 5.09 (2H, s, CH2), 5.56 (1H, bs, NH), 6.70 - 6.73 (2H, m), 6.77 (1H, d, 3J = 8.4 Hz), 7.03 - 7.06 (2H, m), 7.22 - 7.39 (8H, m); δC (100.5 MHz, CDCl3) 31.3 (CH2), 38.6 (CH2), 43.5 (CH2), 56.0 (OCH3), 70.8 (OCH2), 111.8 (CH), 114.3 (CH), 121.0 (CH), 127.4 (2C, CH), 127.6 (2C, CH), 127.5 (Cquat), 127.7 (CH), 128.5 (3C, CH), 128.6 (2C, CH), 133.0 (Cquat), 137.1 (Cquat), 147.9 (Cquat), 148.1 (Cquat), 172.0 (Cquat, CO); MS (FAB, 3-nitrobenzyl alcohol) m/z (%) 376 (MH+, 11). N-Benzyl 3-hydroxy-4-methoxyphenylpropionamide (35). -colorless solid, mp. 116˚C - 117˚C (Lit. mp. 117 ˚C  ); νmax (KBr/cm−1) 3501 (bs), 3295 (bs), 1636, 1517, 1453, 1276, 1215, 1128, 1024, 862, 805, 696; δH (400 MHz, CDCl3) 2.47 (2H, t, 3J = 7.6 Hz), 2.89 (2H, t, 3J = 7.6 Hz), 3.85 (3H, s, OCH3), 4.39 (2H, d, 3J = 5.6 Hz, NCH2), 5.60 (1H, bs, NH), 6.65 (1H, dd, 3J = 8.4 Hz, 4J = 2.2 Hz), 6.73 (1H, d, 3J = 8.4 Hz), 6.76 (1H, d, 4J = 2.0 Hz), 7.13 - 7.15 (2H, m), 7.24 - 7.30 (3H, m); δH (100.5 MHz, CDCl3) 31.1 (CH2), 38.6 (CH2), 43.6 (NCH2), 56.0 (OCH3), 110.7 (CH), 114.4 (CH), 120.0 (CH), 127.4 (CH), 127.8 (2C, CH), 128.6 (2C, CH), 133.9 (Cquat), 137.5 (Cquat), 145.1 (Cquat), 145.6 (Cquat), 172.0 (Cquat, CO); MS (FAB, 3-nitrobenzyl alcohol) m/z (%) 286 (MH+, 21). Benzyl 4-aminobenzoate (37)  . -colorless needles, mp. 97˚C; νmax (KBr/cm−1) 3456, 3359, 3223, 2937, 1683, 1632, 1572, 1517, 1436, 1380, 1310, 1278, 1170, 1116, 974, 846, 771, 730, 691; δH (400 MHz, CDCl3) 4.06 (2H, bs, NH2), 5.31 (2H, s, OCH2), 6.62 (2H, d, 3J = 8.8 Hz), 7.30 - 7.44 (5H, m), 7.88 (2H, d, 3J = 8.8 Hz); δC (100.5 MHz, CDCl3) 66.1 (OCH2), 113.8 (2C, CH), 119.6 (Cquat), 128.0 (2C, CH), 128.5 (2C, CH), 131.8 (3C, CH), 136.6 (Cquat), 150.9 (Cquat), 166.5 (Cquat, CO); MS (FAB, 3-nitrobenzyl alcohol) m/z (%) 228 (MH+, 10). 3-Aminobenzyl benzyl ether (39)  . -as a pale yellow oil; νmax (KBr/cm−1) 3500 (bs, NH), 3369 (NH), 3029, 2855, 1619, 1493, 1358, 1299, 1068; δH (400 MHz, CDCl3) 4.48 (2H, OCH2), 4.55 (2H, OCH2), 6.62 - 6.64 (1H, m), 6.73 - 6.77 (2H, m), 7.14 (1H, dd, 3J = 8.0 Hz, 3J = 8.0 Hz), 7.25 - 7.39 (5H, m); δC (100.5 MHz, CDCl3) 70.0 (OCH2), 70.1 (OCH2), 111.5 (CH), 114.5 (CH), 116.2 (CH), 117.6 (CH), 127.8 (2C, CH), 128.4 (2C, CH), 129.3 (CH), 138.3 (Cquat), 139.5 (Cquat), 146.2 (Cquat); MS (FAB, 3-nitrobenzyl alcohol) m/z (%) 214 (MH+, 19). 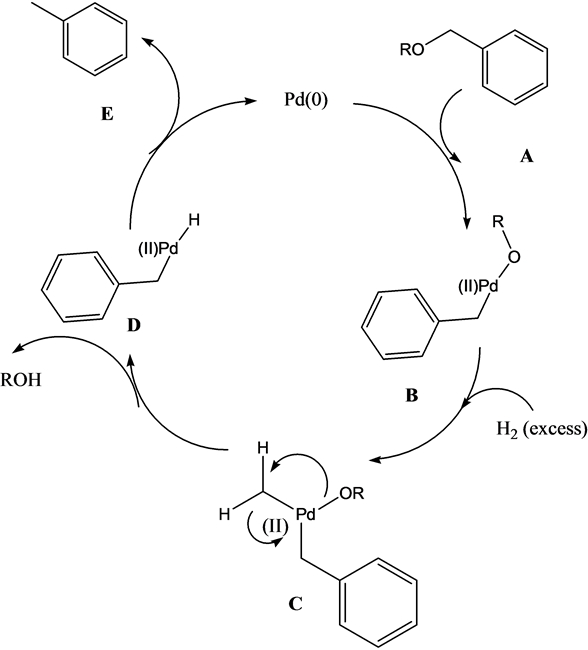 O-Benzyl 2-aminophenol (44)  . -slowly crystallizing oil; mp. 36˚C (Lit. mp. 38˚C  ) νmax (KBr/cm−1) 3466, 3378, 3061, 3032, 2927, 2869, 1613, 1504, 1454, 1381, 1276, 1216, 1142, 1042, 1016, 910, 856, 735, 697; δH (400 MHz, CDCl3) 3.60 (2H, bs, NH), 5.09 (2H, s, OCH2), 6.71 - 6.88 (4H, m), 7.32 - 7.42 (3H, m), 7.45 (2H, d, 3J = 7.6 Hz); δC (100.5 MHz, CDCl3) 70.4 (OCH2), 112.1 (CH), 115.3 (CH), 118.5 (CH), 125.5 (CH), 127.6 (2C, CH), 128.0 (CH), 128.6 (2C, CH), 136.4 (Cquat), 137.2 (Cquat), 146.5 (Cquat); MS (FAB, 3-nitrobenzyl alcohol) m/z (%) 200 (MH+, 11). 2-Aminophenol (45). -colorless solid; mp. 173˚C (Lit. 174˚C  ); νmax (KBr/cm−1) 3377 (NH), 3306 (NH), 1608, 1515, 1475, 1406, 1285, 1271, 900, 751, 745; δH (400 MHz, DMSO-d6) 4.70 (2H, bs), 6.40 (1H, d, 3J = 7.6 Hz), 6.54 - 6.59 (2H, m), 6.65 (1H, d, 3J = 6.8 Hz), 8.70 (1H, bs, OH); δC (100.5 MHz, DMSO-d6) 114.5 (2C, CH), 116.5 (CH), 119.5 (CH), 136.4 (Cquat), 144.0 (Cquat); MS (EI, 70 eV) m/z (%) 109 (M+,100), 80 (32). The reagent system was also noted to be effective in C-Cl dechlorination reactions  . However, when we tried to use NaBH4, CH3CO2H, Pd/C in O-debenzylation reactions, the O-debenzylation, e.g. from 3 to 4, did not proceed, even with an excess of reagent (Scheme 2). This result gave the authors an indication that NaBH4, CH3CO2H, Pd/C could be used as a reaction system that would allow to hydrogenate double bonds in the presence of benzyl ethers and benzyl esters. The following describes hydrogenations of alkenes carrying O-benzyl ether, O-benzyl ester and N-benzyl amide functions with this reducing agent. When a finely ground powder of NaBH4 is added to a mixture of alkene, acetic acid and Pd/C in toluene or benzene, fine gas bubbles appear immediately. The sodium borohydride reacts with the acetic acid, giving, apart from sodium acetate (8), hydrogen and borane. Borane (9), or its formed dimer, diborane (10), would then hydrolyse with the water introduced with the acetic acid and solvents to form boric acid (11) and further hydrogen (Scheme 3). The hydrogen thus produced in situ provides the reagent in the Pd/C catalyzed hydrogenation reaction of the alkenes. The life-time of the borane (9)/diborane (10) produced in the reaction has not been ascertained and so great care must be taken, as borane (9)/diborane (10) are highly toxic, and a complete hydrolysis of the borane with completion of the hydrogenation of the alkenes has not been established. With NaBH4, CH3CO2H, Pd/C in toluene or benzene, alkenes 12-24, carrying O-benzyl ether functions and/or O-benzyl ester groups could be hydrogenated effectively without loss of the O-benzyl function. Multiple double bonds in a substrate are completely hydrogenated under the conditions as can be seen in the transformation of 22 to 23. Ketones are not reduced with NaBH4, CH3CO2H, (cat.) Pd/C, evident in the conversions of 20/22 to 21/23. Upon careful handling, even a carbaldehyde-function can be retained in the reaction as can be seen in the transformation of 2-benzyloxycinnamaldehyde (24) to 2-benzyloxyphenylpropionaldehyde (25) with only relatively small amounts of 3-(2-benzyloxyphenyl)propanol (26) evident as by-product (Figure 1). It is known that also ammonia, ammonium acetate and pyridine suppress reductive O-debenzylation with hydrogen in the presence of Pd/C, while the hydrogenation of alkenes proceeds under the conditions  . Also, amines have been noted to suppress the reductive cleavage of benzyl ethers  - . Momentarily, the mechanistic reasoning behind the suppression of the O-debenzylation in our case is not clear. The accepted mechanism for the Pd(0) hydrogenative O-debenzylation is shown in Scheme 4. It must be noted that the reaction is taken place under heterogeneous conditions, while the mechanism does not take this into account. It is believed that the reductive step D to E is significantly important to determine the character of the “Pd(0)” species and may depend on the reactive system. Also, N-benzyl cinnamides 27, 29, 31 and 33 were subjected to hydrogenation with NaBH4, CH3CO2H in the presence of cat. Pd/C to afford the corresponding N-benzyl phenylpropionamides 28, 30, 32 and 34 (Scheme 5). Due to the poor solubility of 31 and 33 in toluene or benzene, their hydrogenation was carried out in a mixture of toluene and THF (1/1 v/v). No N-debenzylation was observed in the reactions. Overall, the stability of the benzyl protective group (Bzl) was found to be -NHBzl; -CH2OCH2Ph > PhOCH2Ph > -CO2CH2Ph, under the reaction conditions used. This could be seen when N-benzyl 4-methoxy-3-benzyloxycinnamide 33 was subjected to prolonged reaction with NaBH4, CH3CO2H, Pd/C in a solvent mixture of toluene and THF (1:1 v/v), where the O-benzyl function was reductively cleaved as well to give phenol 35 (Scheme 6). Scheme 2. O-Debenzylation of 3 does not proceed under the conditions. Scheme 3. Reaction sequences of NaBH4 (7) in presence of acetic acid (6) and water. Figure 1. Reduction of alkenes carrying O-benzyl esterand/or O-benzyl ether functions. Scheme 4. Accepted mechanism for Pd(0) catalyzed hydrogenative O-debenzylation. Scheme 5. Hydrogenation of N-benzyl cinnamides to N-benzyl phenylpropionamides. Scheme 6. Concomittant O-debenzylation and alkene hydrogenation of 33 with NaBH4, acetic acid and Pd/C as catalyst. Scheme 7. Reductive transformation of nitroarenes to anilines with NaBH4, acetic acid and Pd/C as catalyst. Scheme 8. Reductive transformation of nitroarenes with benzyl functions in close proximity to the nitro group. of the nitro group can pass through a number of intermediates and can be mechanistically complex, it is believed that a reactive intermediate along the pathway from nitro- to amino-function leads to the reductive cleavage of the benzyl ether in 44 and benzyl ester in 41. With NaBH4, AcOH in the presence of catalytic amounts of Pd/C, a simple reactive system was utilized to hydrogenate alkenes in the presence of O-benzyl ether and benzyl ester protective groups, which are not affected by the reaction. It was found that an aromatic nitro function is reduced to amino group by NaBH4, AcOH, cat. Pd/C. Here a benzyl ether or a benzyl ester function can then be retained, when in the substrate the nitro group and the benzyl function are positioned adequately far apart. 1. Russo, A.T., Amezcua, K.L., Huynh, V.A., Rousslang, Z.M. and Cordes, D.B. (2011) A Simple Borohydride-Based Method for Selective 1,4-Conjugate Reduction of α,β-Unsaturated Carbonyl Compounds. Tetrahedron Letters, 52, 6823-6826. 2. Tran, A.T., Huynh, V.A., Friz, E.M., Whitney, S.K. and Cordes, D.B. (2009) A General Method for the Rapid Reduction of Alkenes and Alkynes Using Sodium Borohydride, Acetic Acid, and Palladium. Tetrahedron Letters, 50, 1817-1819. 3. Wuts, P.G.M. and Greene, T.W. (2007) Greene’s Protective Groups in Organic Synthesis. 4th Edition, John Wiley & Sons, Hobo-ken. 4. Rylander, P.N. (1985) Hydrogenation Methods. Academic Press, New York, 157-163. 5. Miyazaki, Y., Hagio, H. and Kobayashi, S. (2006) Practical Access to the Polymer Incarcerated Platinum (PI Pt) Catalyst and Its Application to Hydrogenation. Organic Biomolecular Chemistry, 4, 2529-2531. 6. Wu, G., Huang, M., Richards, M., Poirier, M., Wen, X. and Draper, R.W. (2003) Novel ZnX2-Modulated Pd/C and Pt/C Catalysts for Chemoselective Hydrogenation and Hydrogenolysis of Halogen-Substituted Nitroarenes, Alkenes, Benzyl Ethers, and Aromatic Ketones. Synthesis, No. 11, 1657-1660. 7. Dovell, F.S. and Greenfield, H. (1965) Platinum Metal Sulfides as Heterogeneous Hydrogenation Catalysts. Journal of the American Chemical Society, 87, 2767-2768. 8. (a) Monguchi, Y., Marumoto, T., Ichikawa, T., Miyake, Y., Nagae, Y., Yoshida, M., Oumi, Y. Sawama, Y. and Sajiki, H. (2015) Unique Chemoselective Hydrogenation Using a Palladium Catalyst Immobilized on Ceramic. ChemCatChem, 7, 2155-2160. (b) Esaki, H., Hattori, T., Tsubone, A., Mibayashi, S., Sakata, T., Sawama, Y. Monguchi, Y., Yasuda, H., Nosaka, K. and Sajiki, H. (2013) Chemoselective Hydrogenation Catalyzed by Pd on Spherical Carbon. ChemCatChem, 5, 3629-3635. (c) Takahashi, T., Yoshimura, M., Suzuka, H., Maegawa, T., Sawama, Y., Monguchi, Y. and Sajiki, H. (2012) Chemoselective Hydrogenation Using Molecular Sieves-Supported Pd Catalysts: Pd/MS3A and Pd/MS5A. Tetrahedron, 68, 8293-8299. 9. (a) Sajiki, H. (1995) Selective Inhibition of Benzyl Ether Hydrogenolysis with Pd/C Due to the Presence of Ammonia, Pyridine or Ammonium Acetate. Tetrahedron Letters, 36, 3465-3468. (b) Sajiki, H., Kuno, H. and Hirota, K. (1997) Chemoselective Inhibition of the Hydrogenolysis of the MPM Protective Group for Phenolic Hydroxy Functions Using a Pd/C-Pyridine Catalyst. Tetrahedron Letters, 38, 399-402. (c) Saijiki, H., Kuno, H. and Hirota, K. (1998) Suppression Effect of the Pd/C-Catalyzed Hydrogenolysis of a Phenolic Benzyl Protective Group by the Addition of Nitrogen Containing Bases. Tetrahedron Letters, 39, 7127-7130. (d) Sajiki, H. and Hirota, K. (1998) The Formation of a Novel Pd/C Catalyzed Hydrogenation Using a Catalyst Posion: Chemoselective Inhibition of the Hydrogenolysis for O-Benzyl Protective Group by the Addition of a Nitrogen-Containing Base. Tetrahedron, 54, 13981-13996. (e) Sajiki, H. and Hirota, K. (2003) Palladium-Catalyzed Chemoselective Hydrogenation in the Presence of a Phenolic MPM Protective Group Using Pyridine as a Catalyst Poison. Chemical and Pharmaceutical Bulletin, 51, 320-324; (e) Sajiki, H., Hattori, K. and Hirota, K. (1998) The Formation of a Novel Pd/C-Ethylenediamine Complex Catalyst: Chemoselective Hydrogenation without Deprotection of the O-Benzyl and ZV-Cbz Groups. The Journal of Organic Chemistry, 63, 7990-7992. 10. Sajiki, H. and Monguchi, Y. (2011) Development of Palladium Catalysts for Chemoselective Hydrogenation. In: Pharmaceutical Process Chemistry, Wiley-VCH Verlag, Weinheim, Chpt. 4, 77-79. 11. (a) Mori, A., Miyakawa, Y., Ohashi, E., Haga, T., Maegawa, T. and Sajiki, H. (2006) Pd/C-Catalyzed Chemoselective Hydrogenation in the Presence of Diphenylsulfide. Organic Letters, 8, 3279-3281. (b) Mori, A., Mizusaki, T., Miyakawa, Y., Ohashi, E., Haga, T., Maegawa, T., Monguchi, Y. and Sajiki, H. (2006) Chemoselective Hydrogenation Method Catalyzed by Pd/C Using Diphenylsulfide as a Reasonable Catalyst Poison. Tetrahedron, 62, 11925-11932. 12. Al Azani, M., Al Sulaibi, M., Al Soom, N., Al Jasem, Y., Bugenhagen, B., Al Hindawi, B. and Thiemann, T. (In Press) The Use of BrCCl3-PPh3 in Appel-Type Transformations to Esters, O-Acyloximes, Amides, and Acid Anhydrides. Submitted to Comptes Rendus Chimie. 13. Rosales, A., Rodríguez-García, I., López-Sánchez, C. and álvarez-Corral, M. (2011) Solvent Influence in the Rh-Catalyzed Intramolecular 1,6 C-H Insertions: A General Approach to the Chromane and Flavanone Skeletons. Tetrahedron, 67, 3071-3075. 14. Shiina, I. and Kawakita, Y.-I. (2004) The Effective Use of Substituted Benzoic Anhydrides for the Synthesis of Carboxamides. Tetrahedron, 60, 4729-4733. 15. Eliel, E.L. and Anderson, R.P. (1952) Benzyl Esters from Methyl Esters and Benzyldimethylamine. Journal of the American Chemical Society, 74, 547-549. 16. Weast, R.C., Ed. (1972) CRC Handbook of Chemistry and Physics. 53rd Edition, CRC Press, Cleveland. 17. Pearson, A.J. and Lee, K. (1994) A Formal Total Synthesis of the ACE Inhibitor K-13. An Application of Arene- Ruthenium Chemistry to Complex Chemical Synthesis. The Journal of Organic Chemistry, 59, 2304-2313. 18. Arnsberry, K.L. and Borchert, R.T. (1990) The Lactonization of 2’-Hydroxycinnamic Acid Amides, a Potential Prodrug for Amines. The Journal of Organic Chemistry, 55, 5867-5877. 19. Kurian, G.A., Kumar, R., Venkatesh, V., Swesh, S. and Paddikkala, J. (2008) In Vivo and in Vitro Evaluation of Free Radical Scavenging Potential of Methanol Abstract of Desmodium gangeticum Root: A Possible Explanation through GC Mass Analysis. Pharmacognosy Magazine, 4, 162-171. 20. Das, S.K. and Panda, G. (2009) Enantioselective Synthesis of Functionalized 1-Benzoxepins by Phenoxide Ion Mediated 7-endo-tet Carbocyclization of Cyclic Sulfates. European Journal of Organic Chemistry, 2009, 204-207. 21. Lee, J. and Lee, L. (1999) A Facile and Practical Synthesis of Capsazepine, a Vallinoid Receptor Antagonist. Synthetic Communications, 29, 4127-4140. 22. Mori, A., Mizusaki, T., Kawase, M., Maegawa, T., Monguchi, Y., Takao, S., Takagi, Y. and Sajiki, H. (2008) Novel Palladium-on-Carbon/Diphenyl Sulfide Complex for Chemoselective Hydrogenation: Preparation, Characterization and Application. Advanced Synthesis & Catalysis, 350, 406-410. 23. Chen, H., Bashiardes, G., Mailliet, P., Commercon, A., Sounigo, F., Boiziau, J., Parker, F., Tocques, B., Roques, B.P. and Gorbay, C. (1996) Synthesis and Biological Evaluation of a Series of Hydroxybenzylphenylamine Derivatives as Inhibitors of EGF Receptor-Associated Tyrosine Kinase Activity. Anti-Cancer Drug Design, 11, 49-71. 24. Oae, S., Iida, K., Shinhama, T. and Takata, T. (1981) The Pschorr-Cyclization of Aromatic Amines with T-Butyl Thionitrate in Non-Aqueous Media. The Bulletin of the Chemical Society of Japan, 54, 2374-2378. 25. Rousslang, Z.M., Russo, A.T. and Cordes, D.B. (2011) Selec-tive Reductions Using Sodium Borohydride and Palladium. Proceedings of the 241st ACS National Meeting, Anaheim, 27-31 March 2011, CHED-1068. 26. Czech, B.P. and Bartsch, R.A. (1984) Effect of Amines on O-Benzyl Group Hydrogenolysis. The Journal of Organic Chemistry, 49, 4076-4078. 27. Pennings, M.L.M. and Reinhoudt, D.N. (1983) Chemistry of Four-Membered Nitrones. 5. Synthesis and Oxidation of 1-Hydroxyazetidines. The Journal of Organic Chemistry, 48, 4043-4048. 28. Fleet, G.W.J. and Smith, P.W. (1985) Enantioselective Syntheses of Deoxymannojirimycin, Fagomine, and 2R,5R- Dihydroxymethyl-3R,4R-Dihydroxypyrrolidine from D-Glucose. Tetrahedron Letters, 26, 1469-1472. 29. Vanier, G.S. (2007) Simple and Efficient Microwave-Assisted Hydrogenation Reactions at Moderate Temperature and Pressure. Synlett, 2007, 131-135. 30. Berthold, H., Schotten, T. and Honig, H. (2002) Transfer Hydrogenation in Ionic Liquids under Microwave Irradiation. Synthesis, 1607-1610. 31. Bae, J.W., Cho, Y.J., Lee, S.H., Yoon, C.O.M. and Yoon, C.M. (2000) One-Pot Synthesis of N-Alkylaminobenzenes from Nitroaromatics: Reduction Followed by Reductive Amination Using B10H14. Chemical Communications, 1857- 1858.